International Energy Outlook 2011 (IEO2011) released by the U.S. Energy Information Administration (EIA) presents updated projections for world energy markets through 2035. The IEO2011 Reference case projection does not incorporate prospective legislation or policies that might affect energy markets. Worldwide energy consumption grows by 53 percent between 2008 and 2035 in the Reference case, with much of the increase driven by strong economic growth in the developing nations, especially China and India. “China and India account for half of the projected increase in world energy use over the next 25 years. China alone, which only recently became the world’s top energy consumer, is projected to use 68 percent more energy than the United States by 2035,” said Acting EIA Administrator Howard Gruenspecht. China and India lead the growth in world demand for energy in the future. The economies of China and India were among those least affected by the worldwide recession. They continue to lead world economic growth and energy demand growth in the Reference case. In 2008, China and India combined accounted for 21 percent of total world energy consumption. 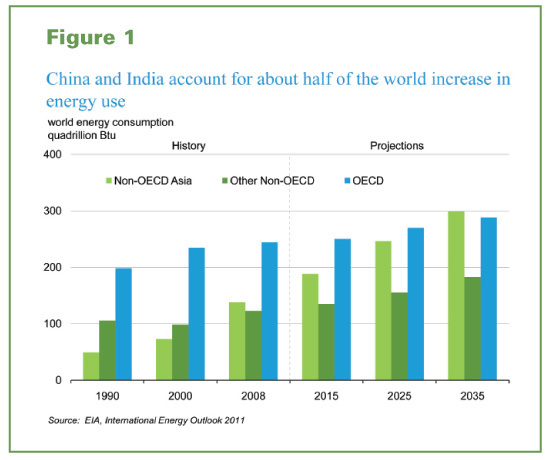 With strong economic growth in both countries over the projection period, their combined energy use more than doubles by 2035, when they account for 31 percent of world energy use in the IEO2011 Reference case (Figure 1). In 2035, China’s energy demand is 68 percent higher than U.S. energy demand. Renewable energy is projected to be the fastest growing source of primary energy over the next 25 years, but fossil fuels remain the dominant source of energy. Renewable energy consumption increases by 2.8 percent per year, and the renewable share of total energy use increases from 10 percent in 2008 to 15 percent in 2035 in the Reference case. Fossil fuels, however, continue to supply much of the energy used worldwide throughout the projection, and they still account for 78 percent of world energy use in 2035. While the Reference case projections reflect current laws and policies as of the start of 2011, past experience suggests that renewable energy deployment is often significantly affected by policy changes. Natural gas has the fastest growth rate among the fossil fuels over the 2008 to 2035 projection period. 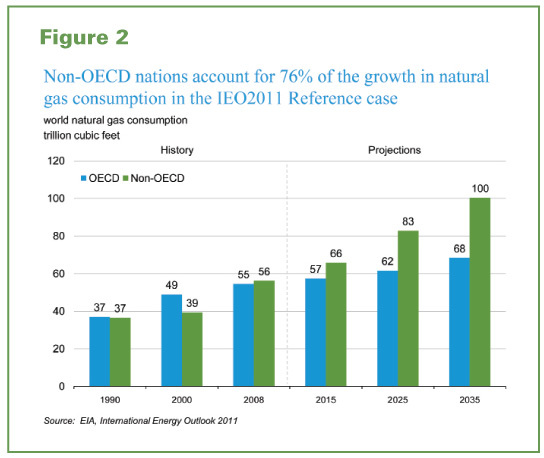 World natural gas consumption increases 1.6 percent per year, from 111 trillion cubic feet in 2008 to 169 trillion cubic feet in 2035. Unconventional natural gas (tight gas, shale gas, and coalbed methane) supplies increase substantially in the IEO2011 Reference case—especially from the United States, but also from Canada and China. World oil prices remain high in the IEO2011 Reference case, but oil consumption continues to grow; both conventional and unconventional liquid supplies are used to meet rising demand. In the IEO2011 Reference case, the price of light sweet crude oil (in real 2009 dollars) remains high, reaching $125 per barrel in 2035. Total world petroleum and other liquids fuel use increases by 26.9 million barrels per day between 2008 and 2035, but the growth in conventional crude oil production is less than half this amount at 11.5 million barrels per day, while production of natural gas plant liquids increases by 5.1 million barrels per day. World production of unconventional resources (including biofuels, oil sands, extra-heavy oil, coal-to-liquids, and gas-to-liquids), which totaled 3.9 million barrels per day in 2008, increases to 13.1 million barrels per day in 2035 (Figure 2). Projected petroleum consumption and prices are very sensitive to both supply and demand conditions. Higher economic growth in developing countries coupled with reduced supply from key exporting countries result in a High Oil Price case in which real oil prices exceed $169 per barrel by 2020 and approach $200 per barrel by 2035. Conversely, lower economic growth in developing countries coupled with increased supplies from key exporting countries result in a Low Oil Price case in which real oil prices fall to about $55 per barrel in 2015 and then gradually decline to $50 per barrel after 2030, where they remain through 2035. Electricity is the world’s fastest-growing form of end-use energy consumption in the Reference case, as it has been for the past several decades. Net electricity generation worldwide rises by 2.3 percent per year on average from 2008 to 2035. Renewables are the fastest growing source of new electricity generation, increasing by 3.0 percent and outpacing the average annual increases for natural gas (2.6 percent), nuclear power (2.4 percent), and coal (1.9 percent). The transportation sector accounted for 27 percent of total world delivered energy consumption in 2008, and transportation energy use increases by 1.4 percent per year from 2008 to 2035. The transportation share of world total liquids consumption increases from 54 percent in 2008 to 60 percent in 2035 in the IEO2011 Reference case, accounting for 82 percent of the total increase in world liquids consumption. In the IEO2011 Reference case, energy-related carbon dioxide emissions rise from 30.2 billion metric tons in 2008 to 43.2 billion metric tons in 2035?an increase of 43 percent. Much of the increase in carbon dioxide emissions is projected to occur among the developing nations of the world, especially in Asia. International Energy Outlook 2011 is available at www.eia.gov/forecasts/ieo/.